Thanks to everyone who attended the recent launch our new Parent Education Evenings. For our first topic we focused on developig toilet independence with pre-primary age children. Since parents asked so many great questions, we are using this week’s blog to share some of the more memorable topics brought up during the Q and A session. Q: My 18-month-old suddenly showed interest in the toilet, not long after she just as suddenly lost interest. What can I do to encourage her to use the toilet? A: It is important that your child initiates interest in this process. Give your child time to learn. Keep trying but don’t rush. She will show signs again, but try to not put any pressure on her. Q: What should I say to my toddler? He doesn’t want anything to do with the toilet. Remember, everyone poops! It is OK, DON’T TAKE IT PERSONAL! Try and use positive language, never shameful language. Think about it, your toddler has FULL CONTROL – you can’t do anything if she decides to wet her pants, so there is nothing to gain by turning the process into a power struggle. Q: How do I know when it is time to wear underwear instead of a diaper? A: Look for a pattern of “staying dry” for periods of time. If your child will use the toilet about every two hours, or at least try, you are ready to take the plunge,PUT UNDERWEAR ON! YAY! But, if he is still wet in between the two hours, he likely isn’t quite ready. Remember – move forward, try not to move backwards. Even if you start to experience MORE accidents, stick with it. KEEP GOING! Your child knows that you may “give in”, why make the effort if they know they can get the diaper back??? 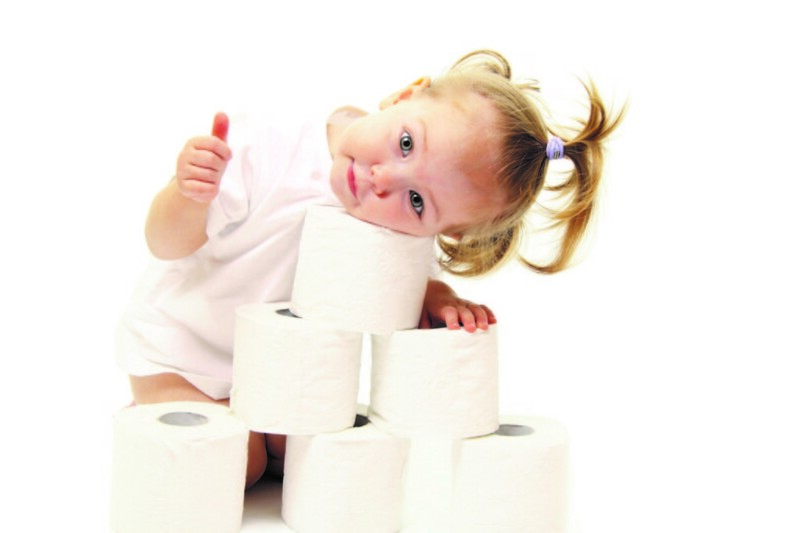 Q: My daughter insists on the diaper when she poops, she won’t go if I don’t give her a diaper! A: Get rid of the diapers, tell her “there are no more diapers” eventually she will either poop in her underwear, (she won’t do this too often, it is uncomfortable and messy) or she will sit on the toilet. BE STRONG! Q: When can I switch to underwear at night? A: Decrease liquids in evening, use toilet before going to bed. Put a plastic covering under the sheet to protect the mattress. There may be a few accidents, but eventually they will make it through the night. A: No pull ups – go from diaper to underwear. It is important for them to feel the wetness. It is ok to be uncomfortable for a bit. Be close by a bathroom. Help them be successful. Don’t take long trips to the mall on the weekend. Stay close to home or family where you can take your child to the bathroom frequently. Clothing! Clothing is so important for the success of your child using the toilet. These are cute and your child might look fantastic, but trying to maneuver in and out of clothing to make it to the toilet in time makes this a struggle for young children. Spend the weekend at home and have a “potty party”. Set a fun alarm, when it goes off, jump up, be excited and go to the bathroom! Dress your child’s favorite stuffed animal in a diaper, take the stuffed animal to the potty when it’s time for him to go. Let your child change the stuffed animal from diaper to underwear.